Beautifully engraved certificate from Activision. This historic document was printed by the American Banknote Company and has an ornate border around it with a vignette of the company logo. This item has the printed signatures of the Company’s Chairman of the Board and Secretary. Activision, Inc. is a leading international publisher of interactive entertainment software products. The company maintains a diverse portfolio of products that span a wide range of categories and target markets and can be used on a variety of game hardware platforms and operating systems. The company has created, licensed and acquired a group of highly recognizable brands that it markets to a growing variety of consumer demographics. 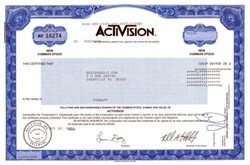 Activision's products cover the action, adventure, action sports, racing, role-playing, simulation and strategy game categories. The company offers its products in versions that operate on the PlayStation 2 computer entertainment system and PlayStation game console from Sony Computer Entertainment, Xbox video game system from Microsoft, Nintendo GameCube, the Nintendo Game Boy Color and Game Boy Advance, as well as on personal computers. At present, the company has 153 different titles in various stages of production, development and planning, 80 of which are in production and development and 73 of which are in various planning stages. Driven partly by the enhanced capabilities of the next-generation of platforms, the company believes that in the next few years there will be significant growth in the market for interactive entertainment software and it plans to leverage its skills and resources to extend its leading position in the industry.